What would you say about smart traffic lights that always turn green? Recipe for disaster? A reader comment on another site took issue with a headline suggesting lights would always turn green, saying, "Obviously the lights won't 'always' turn green. If they turned green for both traffic streams at the same time there would be chaos." Actually, smart lights will be put to the test in the UK whereby traffic light technology will communicate with a driver's smartphone to make sure the driver can arrive as the signal changes. The scheme is from engineering firm AECOM. The benefit of the lights is that it can address the patience-draining stop and go traffic that so many bear during peak travel hours. "AECOM's lights will actually be able to communicate wirelessly with vehicles as they approach. That will allow them to pass along timing information and help vehicles determine what speed will allow the driver (or passengers, in autonomous level 4 or 5 situations) to cruise along with minimal stoppages," wrote Lee Mathews in Geek.com. Taking on start-stop traffic is beneficial as it causes less wear in the brakes, said The Telegraph, as well as helps to decrease emissions. The lights advise motorists of the speed they should drive at in order to arrive at the next set of lights when they turn green. Francesca Marshall of The Telegraph said the concept is one of five shortlisted entries into a competition regarding roads for driverless cars. The competition is hosted by the National Roads Commission (NIC), Highways England and Innovate UK. NIC chairman Sir John Armitt said: "We can see for ourselves the progress in developing cars for the future, with trials of driverless cars taking place across the country. "We now need to make sure the technology on our roads keeps up." 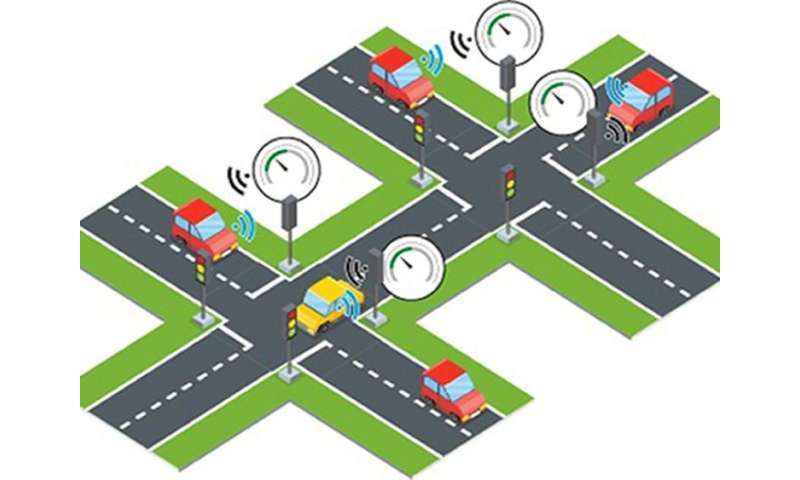 The smart traffic lights join other shortlisted ideas in the competition, including the flexible use of kerbsides, segregated driverless zones, and sat-navs learning through artificial intelligence, the NIC reported. Marshall said the scheme is to be tested using a simulation model of the A59 in York. Heather Hawkins, principal consultant at AECOM, said they were eager to get started, to better understand "the potential impact of vehicle-to-infrastructure technologies on our local road network in York." I hate it when I try to approach a light at a speed that will allow me to hit the light green. Invariably, the light will turn green within a second of my coming to a total stop. I don't see why this has to have any component in a car. Just need "speed to green" sign some distance back from the light to advise drives of a suitable approach speed. I do wish traffic lights were smarter. Again, they don't need interaction with the vehicles, just enough sensors ability to track approaching vehicles so the light can optimize the flow. I spend a lot of time every night at a light which produces a backup of 1500 ft. or so, while cars on the more lightly traveled cross street get through on a single cycle, some not waiting at all. It just needs a sensor loop way back or a vision system - and brains. So why spend our money on defective devices such as traffic lights? Because roundabouts are far more expensive to construct. The lights advise motorists of the speed they should drive at in order to arrive at the next set of lights when they turn green. Excellent idea. The only problem is humans, roughly 50% who tend to be of limited intellectual capacity which also negates successful negotiation of roundabouts all too often. I appreciate the gesture of the governing body, but what do you intend to do with the people who don't have the brain power to deal wth something as simple as this? They will still find a way to gum up the works. The short-term solution is relatively easy. Just install cell technology to read the traffic flow data from a site such as Google Maps, and adjust the timing accordingly. Data is taken from the handshaking from motorists' cell phones. Could be done now from a central site, if all traffic lights are controllable from that site. Longer-term: Install a 360 fish-eye camera at the intersection. From that video input, AI could identify cars, pedestrians and other vehicles (or even blockages such as construction or accidents) that are in, or approaching, the intersection and adjust the lights accordingly; even preemptively. I don't believe AI is that advanced yet, but if AI is advanced enough to drive a car autonomously, it will certainly be able to manage a traffic intersection as well as a traffic policeman could do - probably better.